Lock in a great price for Holiday Inn Cincinnati-Riverfront – rated 8.4 by recent guests! TV unit and cable box needed to be re-set before working. Also remote needed batteries. Not sure if a microwave was supposed to be available but wasn’t. Very convenient for quick travel to US Bank Arena. Easy access to I-75. I didn't stay one night and had to pay for the night that I did not stay. Refunds are not given back very easy. Had a cute bar downstairs if you like that kind of thing. Staff was very friendly. Excellent staff! No microwave but did have small fridge. I liked that the staff were attentive, friendly, and worked with me to address issues I had with the room. I would stay at this location again. Everything was great! Staff was very friendly..room was great! Staff was excellent! Upgraded our room due to a mix up on the reservation. The rooms were nice and clean! Bed was very comfortable. The A/C worked so well we had to turn it up! Food was very good at the on site restaurant Burgers and Crafts! Tempest waited on us both nights that we were there. She was the best! The hotel also has a shuttle to Great American Ball Park for only $1 each way! The location was good. The Front desk staff were very nice and helpful. Holiday Inn Cincinnati-Riverfront This rating is a reflection of how the property compares to the industry standard when it comes to price, facilities and services available. It's based on a self-evaluation by the property. Use this rating to help choose your stay! 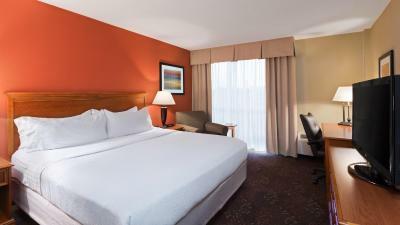 Located across the Ohio River, 2 miles from downtown Cincinnati, this Holiday Inn provides free Wi-Fi in every room. The Greenery, an on-site restaurant, is open daily. 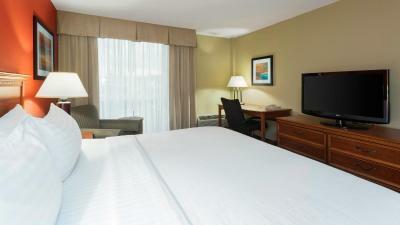 All rooms at the Holiday Inn Cincinnati-Riverfront feature a 32-inch flat-screen TV with cable. A coffee maker and a work desk with desk-level electrical outlet are included. Guests at the Riverfront Holiday Inn can enjoy the outdoor pool, with shaded seating and deck chairs. An on-site fitness center is also open for use. The Greenery features home-style Kentucky meals and burgers. Drinks and appetizers are served in the lounge area. The Cincinnati-Riverfront Holiday Inn is less than 10 minutes from Paul Brown Stadium and The Great American Ball Park, home of Cincinnati’s professional sports teams. The Cincinnati-Northern Kentucky International Airport is less than 13 miles away. When would you like to stay at Holiday Inn Cincinnati-Riverfront? This room includes a sofa bed. 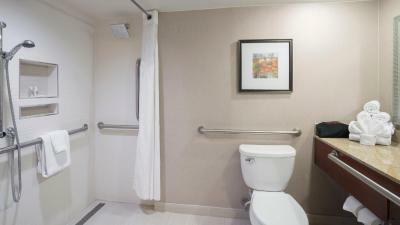 This room includes accessibility features including visual alarms and a hand-held shower head. House Rules Holiday Inn Cincinnati-Riverfront takes special requests – add in the next step! Holiday Inn Cincinnati-Riverfront accepts these cards and reserves the right to temporarily hold an amount prior to arrival. Please note guests must present a valid ID with proof of being 21 years old or older to check in. Bed spread had stains on it and hair! Booked a king room got there and non were “available “ room smelled of mildew and ac unit wouldn’t come on to cool room down. Horrible tv service. Bad reception or no reception on half the stations. No TV guide on tv. Location, close to many places to eat. Not overly noisy even with a bus load of kids. My room phone didn’t work. When I called the front desk from my cell I kept getting put on hold but as soo. As I got put on hold there was this siren noise that forced me to hang up and keep calling back. I was also under the impression that they had an indoor pool which wasn’t the case so after we got settled in our room i shortly found out there wasn’t a indoor pool and switched hotels. Pillows not firm enough. Nothing else. Very clean and updated. Loved the bed! You can hear every little thing in the room next to you. The best was not comfortable. No free breakfast options. The room wasn't properly prepared prior to check in. It smelled as if the bathroom had been used just prior to entering the room. The TV was unplugged the AC was on full blast, a random dirty towel was laying in the corner next to the couch, and the toilet leaked water when flushed.